One explanation for such behavior is that these people are somehow “bad” themselves. Namely, something is, and was perhaps always, immoral about them. This could be the case, and regardless of how we explain or understand what they did, our criminal justice system and we as a society should absolutely hold all such people who do such things fully accountable for their actions. At the same time, I suggest that seeing such behavior—be it sexual assault or other forms of criminal or unethical actions by people who hold power—only as the result of being a “bad” person is overly simplistic. It’s also self-serving and convenient, as it suggests that only “bad” people do bad things, therefore “I” as a “good” person can only do good things. In other words, in addition to considering “bad apples,” we must consider “bad barrels.” We must recognize that situational conditions can bring out the good and bad in all of us. Research by psychologists Stanley Milgram and Philip Zimbardo, among others, provides compelling evidence of the inconvenient reality that we are all capable of good—and, perhaps more importantly—that we are all capable of evil. And regarding people lead or who aspire to lead organizations, there’s a critical lesson to take away. In the letter he wrote [to Joab, one of his military commanders], “Set Uriah in the forefront of the hardest fighting, and then draw back from him, that he may be struck down, and die.” And as Joab was besieging the city, he assigned Uriah to the place where he knew there were valiant men. And the men of the city came out and fought with Joab; and some of the servants of David among the people fell. Uriah the Hittite was slain also. The “Bathsheba syndrome,” as described by the article’s authors, involves the nature of power and leadership. It’s about how successful leaders, due to the very nature of their success, will almost inevitably find themselves in positions that can, if they’re not careful, lead to unethical behavior. Such products of success, the authors argue, leads to an increased probability of wrongdoing. It’s not about whether you’re a good or bad person; it’s not about whether or not you know the rules. It’s about the very outcomes of success. And that should serve as a warning to everyone who aspires to achieve success, at least success when defined as a position of authority within an organization. It’s a reminder that human nature can lead us to abuse our authority, to abuse our power over others to get what we want. It’s a reminder that it’s not just about Harvey Weinstein or King David; it’s about you. It’s about me. Because the minute we start thinking, “I’m a good person, so I would never do that” is the minute that we begin to step down the dangerous path of hubris. 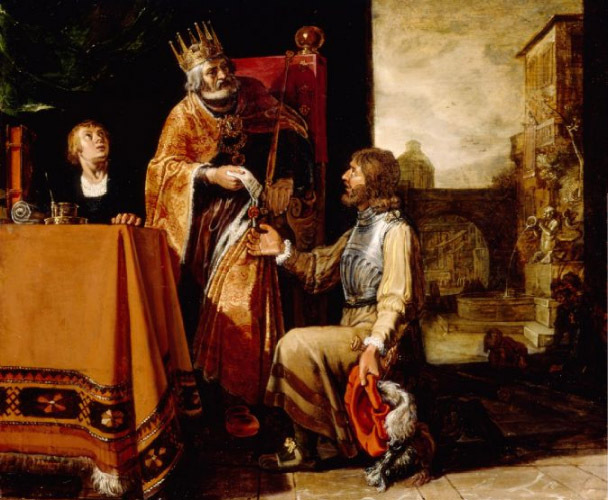 It could happen to you—King David had principles; he was smart. And yet we see what he did. When confronted with ethical dilemmas, it’s best to assume that you will always get caught if you choose the wrong path. Understand that your privileged access to information or people isn’t for your own benefit; it’s not something you deserve. Your job is always to help your organization flourish. Surround yourself with people who will challenge your opinions and decisions, people whose job expressly includes keeping you focused and out of trouble. Use boards of directors or other oversight mechanisms to keep your power in check; if you’re on a board, you should be particularly vigilant in your monitoring activities. So in the midst of the many recent high-profile cases of sexual harassment and assault, it is perhaps timely to remind ourselves of the corrupting nature of power without oversight. When people depend upon us for resources, for approval, for jobs, for anything, the temptation to exploit such relationships exists. Such is the double-edged sword of success. It behooves all of us, therefore, to stay vigilant regarding our own behavior and the behavior of all others in power around us.